April is over. Wow. It went fast. Here's a film of Danny MacAskill riding his bike around Edinburgh, Scotland, and I guess some of it was filmed this past month. I just got a bike like this for my son Arthur this spring, and I imagine he'll be impressed by this. I love bike riding, and this month I've been able to ride back and forth to work two or three times each week. This film shows what is possible with bikes. I wish almost everyone rode bikes to work when the weather isn't cold or stormy. It's sad that so few do. 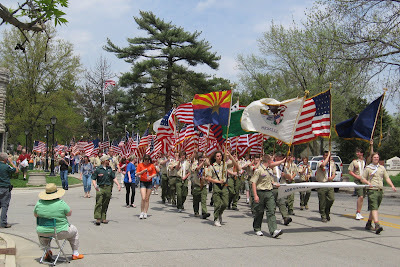 Every year at the end of April boy scouts from all over the United States come to Springfield, Illinois to parade from Lincoln's tomb to the Old State Capitol where Lincoln often worked when he lived here. 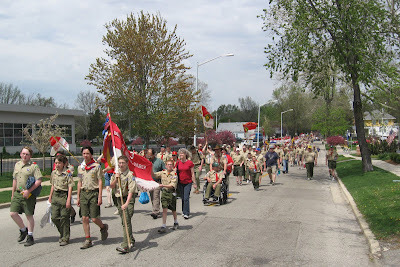 The day before, many scouts participate in a trek from New Salem to Springfield, a walk of nearly 30 kilometers (almost 20 miles). Here is Johnny Smith carrying the American flag at the end of the pilgrimage, near the corner of Jefferson and 6th. 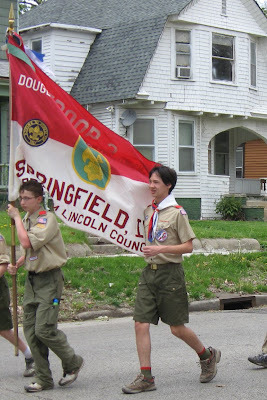 Here is a view of the scouts marching through the streets of Springfield on their way between the tomb and the historic center of the city. Here are the scouts leaving the cemetery where they assembled at Lincoln's tomb. 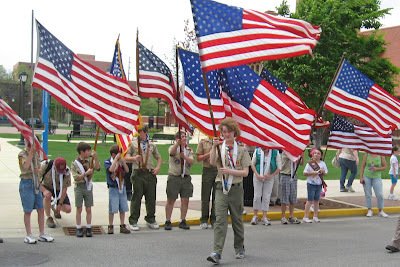 One boy or girl from each troop or pack carries an American flag at the head of the parade. Here is Sebastian marching in the parade. 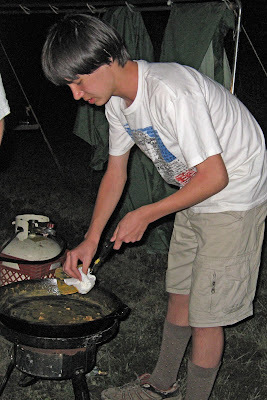 This is Sebastian the night before the parade, when he was cleaning up dishes after dinner out at the campground in New Salem. 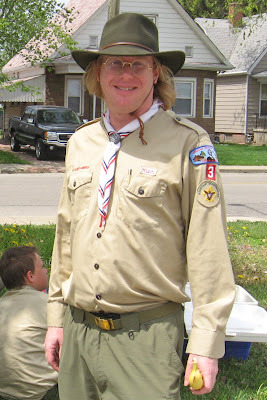 Here I am, one of the assistant scoutmasters. I think one of my projects for the break I get in May (between the spring and summer semesters) will be to create some web pages that provide links to my favorite blogs and web sites. I've already completed one page, for my favorite economics web resources. By the way, the oaks broke up in tiny leaves yesterday, and so now even the oaks have turned green. We're getting too much rain, so it's difficult to find a window between the storms to get to my office. Tonight at 6:30 the MacArthur Street association is having a big event at the South Side Church (where we vote). This street is having some tough economic times (21 vacant or abandoned properties out of 140 in a five-block stretch near our home). There is a three-block stretch of the street that has eight sub-prime lending and check cashing shops quite near our home, and many large vacant commercial addresses. The street is being extended down to a big freeway, where there is a new exit being constructed so traffic can flow directly from the interstate freeway on to our little commercial street. This is disrupting the route of the bike path I ride to school. But oh well, it should help economic progress, I guess. Last week was tax week, and so I'd like to share some thoughts on the taxes we pay here in the Hadley-Ives household. First of all, our income is very close to the median income. I work full-time, and my salary is close to the median full-time year-round earnings of all American men, and after you add in the little bit that Jeri earns, that brings our household close to the median household income. We have two children, so we get some deductions and tax breaks related to that. Actually, since my employer helped pay much of the cost of my health insurance as part of my benefits, and that money could have gone from my employer directly to me in salary if there was a system of public universal medical insurance, the total cost of our household health care and insurance was probably over 10%. SURS Self Managed retirement fund (instead of Social Security): 10.71%. Actually, since my employer matched my contributions, and could have instead just paid me as salary what it contributed to my retirement plan, the total money that went into retirement savings was close to 20%. We're one of the very few American household where we don't pay Social Security taxes. And, unless I take some summer jobs or switch to some other job where I do, I'll never get any Social Security when I retire. Also, since I am in a self-managed retirement plan, I get no set pension at retirement. Instead, I get whatever is in my SURs retirement account, and that's it. When it runs out, I have no source of public pensions with the way our national welfare system is set up now. All the risk and responsibility of saving for retirement has, in my case, been shifted to me. In America we must pay for higher education, and it's quite expensive. So, we save over 5% of our income for sending our sons to college, and we have done so for nearly a decade, since our youngest son was a toddler. I'll have to increase this contribution to 8% or 9% of the household income pretty soon if I want to have enough saved to pay for my older son's college tuition. We also contribute about 2.02% of our income to various charities, including medical research, social services, poverty alleviation, religious work, environmental protection, public television and radio, and the high schools and universities where we were educated. I'd rather we contributed about 5%, but I take a rather large loss of pay by working in the public sector, so I consider my lower salary a form of giving to the public commonweal. If you sum up all our taxes with all the spending we do on health care, retirement, college costs, and charitable giving, it turns out we are spending about 38.56% of our household income on social welfare and government. But, since my pension and health care expenses are somewhat borne by my employer directly rather than passed on to me, probably our household income could be raised by 15% and we would spend every penny of that raise in covering the retirement and health care benefits we're getting from my employer. So, the Hadley-Ives household and our employer contributions to social welfare and government services combined probably equals about 53.56% of our gross income. I was trying to figure out what would be a fair policy of taxation and spending that would give us a society where poverty was eliminated, college was nearly free for most students, and everyone had health care insurance as good as what we have. I also considered what it would cost to adjust Social Security benefits and Medicare and Medicaid benefits so they were sustainable (slight increases in taxation and slight decreases in the amount paid out in retirement pensions for some retired persons, I think). This gave me an estimate of how our taxes and social welfare spending ought to be in the society and government system I would prefer to what we have now. Here are some changes I'd make in taxation. First, I'd forbid property taxes on a home of primary residence up to 125% of the median home value for a state or region. There could still be property taxes on cars, second homes, boats, or the value of a primary residence that exceeds 125% of median home values in an area, but most property taxes would be abolished. I prefer to transfer taxes to income or consumption. Second, I'd abolish most sales taxes. I'd keep taxes on gasoline, cigarettes, alcohol, nights spent in hotels or meals eaten in restaurants, and energy generated by burning fossil fuels, but for most items and services I'd abolish sales taxes. Third, I'd raise income taxes to make up for the lost revenue from the reduction in sales and property taxes. Income taxes should be progressive. Poor people shouldn't pay income tax, working class people ought to pay trivial income taxes (about 1% or 2%), real middle class households (near the median household incomes) ought to pay between 14% and 18% of their income in taxes, upper-middle class households ought to be paying between 20% and 30%, and there ought to be a flat tax ceiling on tax rates set near 45%-50% on the wealthiest 4% of American households. Here are some changes I'd make in policy. There would be a national benefit plan similar to what I get now, or any other standard you want to choose, maybe the medical insurance enjoyed by members of the United States Congress. All health insurance plans would need to have a minimum coverage that matched this national benefit plan or were superior to it. No plan would be allowed that provided less coverage. There would be a national maximum price for the national benefit price. It would equal the less of two figures: either 13% of a household's income or a rate of 5% of the previous year's median year-round full-time salary for each person covered on the policy. Wealthier families would pay the per-person rate and poorer and middle class families would pay the 13% of household income rate. No insurance plan could charge more than the national maximum price for health insurance. The federal government would offer the national benefit plan at the national maximum price. Private insurers would be allowed to offer better plans for lower prices if they wanted. Private insurers would be allowed to sell additional supplementary plans that covered more than the national benefit plan at whatever prices they wanted. The national maximum price would be charged to everyone, but the government would help pay the premiums. For persons or households with incomes lower than 50% of the poverty level the government would pay 100% of the national maximum price. For every 1%-point of the poverty level over 50%-of-poverty a household earned there would be a 0.20%-point reduction in the amount of the health insurance plan covered by the government up to 100% of the poverty level, and then (at 90% of the premium subsidized for households at 100% of poverty) the subsidy would start decreasing by 1%-point of the subsidy for every 1%-point of the poverty level over poverty a household earned, so that the health care subsidy would decline to 0% of the payment when a household earned 190% of poverty (a 10% subsidy for a family earning 180% of poverty, a 50% subsidy for a household earning 140% of poverty, etc.). All insurers, whether government or private, would be forced to accept any legal American resident or citizen into their risk pool as beneficiaries. There could be no screening for conditions, no exclusions, and each insurer would need to charge exactly the same to all it's customers. Second, I'd make states cover the full cost of tuition and fees at their public universities for the top half of students at each public high school within their state, and I'd have a national test for college scholarships, and the American citizens with the top 10% of scores on this national achievement test would earn full tuition and fee scholarships to any university in the world (with perhaps limitations on reasonable tuition and fee levels). I'd also have a national policy to set reasonable tuition and fee levels in higher education. Only universities that charged below the tuition and fee thresholds would be eligible for federal financial aid for their students. Federal research grants would only go to faculty who taught at such schools. The fee and tuition thresholds would be set at reasonable market levels, maybe at 150% of the median tuition and fees charged in some pool of most American 4-year universities. Third, I'd create two national pension programs similar to what the Canadians have. Every American citizen and legal resident would get a pension equal to 110% of the poverty level for an individual, but this pension would be administered as if it were a negative income tax. For every dollar you earned up to 110% of poverty you would lose a dollar of this pension. This would thus give us a 0% poverty rate for Americans over the retirement age. Persons earning over 110% of poverty from their own private resources would get nothing from this first program, but persons earning nothing would get the full 110% of poverty pension income. This would remove the economic incentive (but not the social incentive) for many elderly persons to work, and they would leave the labor force to make more opportunities available for young people. Then, there would also be some sort of a retirement plan more like Social Security is now, and this plan would require everyone to make a flat 4% contribution out of their payroll, and would return to them a benefit level adjusted so that persons who paid more into it would receive more out of it. Everyone would also be encouraged to put money into income-tax deferred retirement savings accounts. A middle class family might put 4% of its income into the second retirement program with the flat contribution rate, and perhaps 3% into the negative income tax to eliminate poverty among the elderly, and then perhaps 4% into a tax-deferred retirement account, so that your typical median income household was saving or paying in taxes about 11% toward retirement security for themselves and everyone else in society. FICA - Medicare: 0% (replaced by the national health care policy). Property taxes: 0% (replaced by a higher state income tax). They should go up for a middle class family such as ours. Currently the very wealthiest Americans pay between 19% and 23% in the federal income taxes after all their deductions and tax loophole advantages (according to the IRS, and not counting their FICA-Medicare and Social Security payroll taxes). I think the wealthiest families ought to pay more, perhaps 30% or 35% in federal income taxes. After you adjust for the Earned Income Tax and other benefits so that poor Americans pay no income tax and then assume that the wealthy ought to be paying around a third of their income in federal income taxes (and perhaps another eighth in state income taxes), your left with a situation where the median middle class needs to pay somewhere between 5.5% and 8.5% of their income in federal income taxes. Households earning $80,000 or $110,000 aren't median middle-class, and such upper middle-class households ought to be paying a rate somewhere between 10% and 30%. Increase to match decreases in sales and property taxes. State taxes should be progressive, with the wealthiest families paying perhaps 11% to 12% of their incomes in state taxes. In my state (Illinois) we now have a flat tax of 3% on incomes. That's ridiculous. We would still pay taxes on gasoline, and our energy consumption that wasn't using renewable energy sources. We would pay 13% for the national plan and still have co-pays worth about a quarter of one percent of our income. We could go with a public plan and have the 13% taken out of our taxes or use a private health insurance plan and have 13% or less paid to them. This includes the two universal retirement programs that replace Social Security plus our tax-deferred retirement savings account. Covered by national and state taxes. When our sons are at college we would pay significantly to help with room and board, but those costs would not be so high that we would need to save 5%-10% of our income for each year that our children are under 18. Charitable giving: same as in the existing system, or about 2.02%. The total amount paid by our family in social welfare an taxes in the new system would be 41.86%. This is more than the 38.56% our family is now paying directly, but probably less than the 44% I estimate is paid by our family and my employer when I exclude the matching pension contribution from my employer. I think my figures are all reasonable, and the figures for typical 4-person households near the median income distribution would be about the same. That is, if you want a well-functioning government that eliminates poverty among persons over 64 years of age, provides free college educations to most of the country's students who are able to do college work, and provides a national health care system, then middle-class families need to figure they'll be paying somewhere between 36% and 46% of their income on public spending (taxation) or personal savings and health insurance. You can't get what you want and have the middle class paying under 36% (unless you totally soak the rich with something like 65% taxes on them), and you don't need to have the middle class pay and save more than 46%. Also, I think this exercise points out that state taxes (and state and local policies) are very important for middle-class taxpayers. We actually are paying more to our state and local governments than we pay to the federal government, yet most news media coverage devotes far more attention to national policy and very little attention to local and state policy. This is funny, because at the level of state and local policies it's pretty easy to meet your elected representatives and influence how they make policy, while it's pretty darn difficult to have much of a say in national policies. This is a good time of year to ride back and forth to my office on my bike. On Thursday the 16th there were very few leaves out, and then on Saturday the 18th as I was riding home I noticed many trees had tiny leaves beginning to show. The magnolias are starting to lose their blossoms and change over to green leaves instead of white and pink petals. The maples are beginning to have leaves join with the seeds and flowers that have been showing. In two weeks, when we have begun the month of May, most trees will be in full leaf. 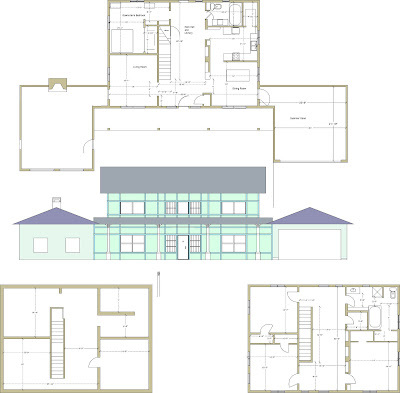 I'm also sharing this design for a house I made a few years ago. If I were building a house, it might be something along these lines. In January of 2003 my mom took this photograph of Jeri and myself holding our son Arthur's hands as we stood on the beach at Santa Cruz, California, facing the sea and the late afternoon sun. It's a nice image, and my mom uses it as a sort of logo for her counseling service. She let me use it as a sort of logo for my social work classes as well. 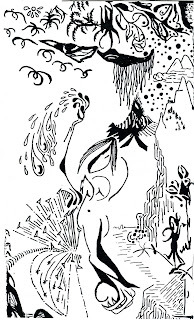 (the image is copyrighted by Virginia Ives). I like how we are silhouetted so we can be almost any couple with a young child. And of course, the sea and the sun are two powerful images. 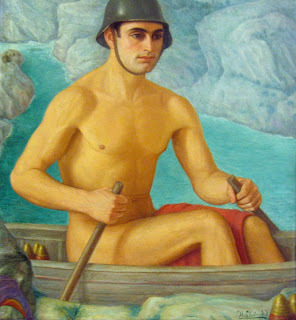 The sea representing vastness, potential, possibility, and depth. The sun representing life-giving energy, power, glory, warmth, and vision. And the beach is a border, a place where two different realms come together, the land, which is known and understood, and the ocean, a place more mysterious, where we are guests, not residents. I took the image and used it to play around with ideas for artistic designs to use with our social work club at the University of Illinois. Here is one where I try to place the image in a context of written words. On the left we have a list of social workers and people who did social work and can be claimed as honorary members of the profession, even if they were not actually trained as social workers. I didn't include the comedian Martin Short on the list, although he is a trained social worker and was considering that career before he got into comedy. 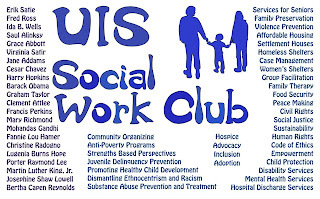 On the lower level and right the words represent issues, concepts, and tasks that are associated with social work and social workers. I'm not entirely satisfied with this design. I need to arrange the text in a more artistic way according to some design, rather than just using this columns of text. 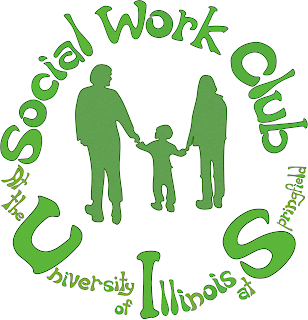 The green lettering design is in fact one the students in the social work club chose to use for their T-shirts this year. The lettering was a bit tricky to do. I'd really like to just create some fonts and then use Illustrator and Word to position the letters. I actually drew these letters (using iWork 08's Pages application) and arranged them using Adobe Photoshop. Too time consuming. But I did achieve the home-made do-it-yourself look that I was striving for, and the letters are supposed to be friendly and free-spirited, and I think they are. I was looking for some old documents to photocopy last night, when I discovered my old middle school yearbooks. I scanned some of the pictures from the yearbooks and uploaded the images to my Facebook photo albums. And then, for a while, I reflected on friendship. Here is one of the images from my 8th grade yearbook. In it I'm in the upper left, holding the French Horn (which I still have). 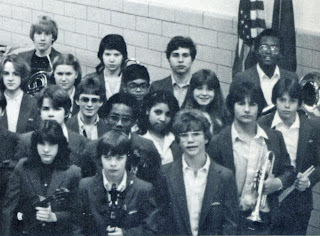 There are a couple students in this photograph who had classes with me all the way from kindergarten through eighth grade, but I moved away from Indianapolis in 1982 and lost contact with most of these people in the 1990s. Now, through the Internet, I've reconnected with several of the old friends in this photograph, including Amy Wharton (Amy Shirk, front row far left), Andy Hamaker (front row on the right), Rob Deppert (front row on the right holding the trumpet), Angela Brown (Angela McCormack, behind Andy Hamaker and Rob Deppert), and John Dishinger (in the third row, on the left, wearing tinted glasses). I wonder if, thanks to the Internet, my own sons will keep up continuously with their childhood friends all through their lives without the 20-year-gap I've had. That could be a good thing. Keeping in touch, even at a distance, makes it easier to occasionally get together for more supportive or fun activities. I find that what I liked (or even loved) about these old friends when we were children and teenagers still is present in who they are now. Rob Deppert and I are still passionate about politics, usually fairly leftist; Andy Hamaker is still involved in music, etc. This particular photograph is one of the first ones taken of me without glasses after I started wearing glasses in 1976. 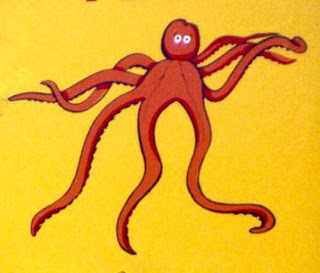 I decided to switch to contact lenses partly because I preferred how I looked without glasses, as in this photograph. (There were also issues with active sports, playing in the snow or rain, etc.). These days I wear contacts and glasses almost equally. I have had some trouble with the contact lenses while commuting to work on my bike, so I'm more likely to wear glasses while riding. 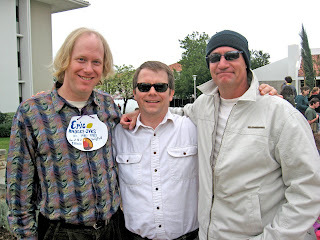 The second photograph here shows me with my friends Dave Sutcliffe and Dave Wicker at the Johnston Center Renewal in Redlands California, during this past February President's Day weekend. Dave Wicker and I were roommates in our freshmen year (1986-87) at the Johnston Center. That year there were several Erics and Daves living in Bekins Hall. The third photograph is a recent one of me with some friends. 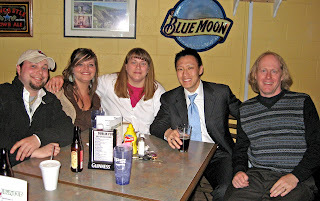 In this case I'm with a few of my graduate students, although Michael Kim had just finished presenting his master's thesis, so he was celebrating becoming a UIS alumni at this particular outing. Amy, the young woman on the left, is finishing up her master's degree with a focus on cross-cultural communication through the arts, with a special emphasis on documentary film and photography. She teaches at Robert Morris College. The woman next to her in the white shirt is Stephanie, and her master's degree focus is in environmental stewardship, with a focus on writing about environmental issues for Christian audiences. Michael Kim is the Korean-American doctor (he is a surgeon) next to me. His master's degree had a focus in surgical education. I'm the guy on the far right. I've spent the better part of two days meeting dealers and private sellers to look at Toyota Sienna LE 8-passenger minivans. As a social scientist and social worker, I'm interested in the variables that go into determining the cost of a car or a used car. I think I have a formula for how to price these cars. Here it is. All figures are in 2009 dollars, so if you find this blog entry in 2010 or later you'll need to adjust using a consumer price index adjustment. For each year past the current year, deduct $360 from the "new price," which is $23,642. You can think of this as $1 per day in depreciation, as a proxy for wear and tear on the car. If the car is in better shape than you would expect, add a few hundred, or subtract a few hundred if it's in worse condition than you would expect, given its age. For every mile the minivan has been driven deduct 15.272 cents. That's it. The price this yields should be within a couple hundred dollars of your final price. If you're a buyer, don't settle for any price more than a few hundred over this predicted price, unless there is some extra special thing that has been added to the basic configuration of the van. If you can get $100 or $200 under this price you have a great deal. If you're a seller, don't sell for significantly under the model's predicted price. My "new price" of $23,642 is about $200 under the lowest "new price" (dealer's invoice) I could find for any basic new 2009 Toyota Sienna LE with one power door and the radio/CD system. Typically a dealer can go under the official dealer's invoice by a small amount if they are eager to make a sale, because there are several hundred dollars the dealer has to use as incentives. Also, the dealer can make money on the sale if you finance, so the car can actually be sold to you within a couple hundred of the dealer's cost if the dealer can then make 4% or 5% interest off a loan to you for the better part of the price of the car. Were I a dealer, I would offer my cars to customers at a few hundred dollars over my actual final cost and then finance the buyers with rates about a quarter percent under the lowest reasonable home equity loan rate a buyer might be able to secure (to prevent buyers from getting home equity loans to pay off their car loan debts to me before I have collected all that 4% or 5% interest on their $20,000+ loans). Various options on the Sienna LE can add $50 to $400 or $800 to the value of a new car, and if you're looking at a car with those extras you just add those numbers to the "new car" price. The only options I was including were one power door, the am/fm radio and cd player, and the 8 passenger configuration. Incidentally, I should add here that we did significant research on various cars that could carry 6 or more people, and our second choice was a Mazda-V (Mazda 5). In fact, I would have purchased a new Mazda-V except that it wasn't quite big enough and our children felt they didn't have enough leg room in the back. The Mazda-V is more environmentally friendly than the Toyota Sienna, so it's rather a pity that we decided against it. I looked at some older Honda Odysseys and decided against that one. I also don't trust our local Honda dealership in Springfield. We looked at the Kia Sedona and Dodge Grand Caravan as well. Using some formulas to account for discounts or price rises related to quality, we still came down to a choice between the Mazda-V and Toyota Sienna. Keep in mind, I'm a buyer with almost no interest in how a car looks. My main concerns are reliability, safety, fuel efficiency, durability, and comfort. What is it with the wind in Springfield? Twice this week I head out to ride to my office in the morning (it's nearly seven miles, going south, then east, then south, then east, then south, then east). Each morning there is strong wind out of the south. Today it was so bad people were telling me they couldn't hardly stand up in it. But I think to myself, "ah, but this afternoon this wind will be at my back and I'll just coast home). Then, twice this week, when it's time for me to ride home, around 6:30 or 5:30, the wind has shifted, and I get wind out of the south or west. There are two really bad places on the commute between my home and the campus. These are in the area where a bike must cross Sixth street near the new Walmart near Eleventh Street. There is a stretch of about 300 meters with no sidewalk nor bike lane, so you must ride your bike either on the right, in a right-turn only lane, or else on the left, in a "go straight" lane. I usually ride on the white line between the two lanes and then make a choice about which traffic lane to use based on where the cars are going. If a car is coming up behind me in the "turn right" lane I head over into the "go straight" lane so I'm not blocking it. Today cars came up behind me in both lanes, so I moved to the middle of the "go straight" lane. After all, a bike is a vehicle and has a right to the road, and the traffic light ahead was red, so although I was slowing traffic, the cars would need to stop anyway. But the two cars behind me start honking. I assume these are friendly horn blasts from friends or students saying hello to me, but then when we get to the red light (it didn't turn green until about three seconds after I arrived at the intersection and moved out of the way of the cars that were following me to go straight), the cars behind me pull up and the drivers (of two cars) each swear at me, insult me, and honk their horns again in anger. Huh? Where did they want me to go? There was no sidewalk, no bike lane, and for that short 300 meter length of road the whole time they were behind me the light ahead of us was red anyway. I could have saved them some gas mileage by forcing them to drive slowly as they approached the red light so they didn't have to come to a complete stop and then accelerate from a dead stop to continue when the light turned green, except that they tail-gated me to get the honor of stopping for two seconds before the traffic light changed color. This problem of a section of road with no sidewalk or bike lane is really crazy at Sixth street near the Walmart because once you get to that traffic light I mentioned there is a wide sidewalk for another 300 meters, and then there is a suddenly a bike lane that you can follow all the way to the UIS campus. Also, if you like to ride on the south outer road of the Interstate until you reach the bike trail that connects Chatham to Springfield, and then take the bike trail into Jerome and Springfield, then the only way to get from this bike trail to the campus is to cross 6th street at this point near the Walmart where there is no bike trail or sidewalk. The same problem exists as you return from campus in the other direction. So, the city of Springfield has these two bike trails, one connecting the UIS campus to... a Walmart, and then ending, and the other a nice interurban trail that connects a road with light traffic to an area just a few hundred meters from the Walmart, but for those few hundred meters that could connect the two systems there is nothing but this very dangerous stretch of road where, as I demonstrated today (for the second time, actually) a cyclist can be verbally abused by car drivers for daring to use traffic lanes. Anyway, betwen having to ride into the wind in both directions on my two days of bike commuting (with rain in my face on the way home today) and having these car drivers shout at me, I'm really upset at the traffic engineers or planners from the city who created this hazardous road situation. I'll talk to someone in city government about this and see what can be done.